The US State Department has updated its guide for American tourists traveling in Israel, and has zeroed in on the real dangers facing visitors. 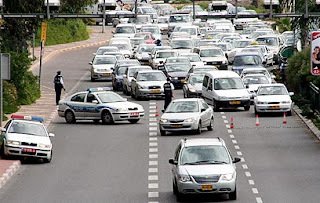 Israeli roads and highways tend to be crowded, especially in urban areas. Aggressive driving is a serious problem and many drivers fail to maintain safe following distances or signal before changing lanes or making turns. Drivers are also prone to stop suddenly on roads without warning, especially in the right lane. Drivers should use caution, as Israel has a high rate of fatalities from automobile accidents. Ynet News reports that the State Department also warns American tourists of car break-ins, especially in beach areas and national parks, particularly in Caesarea. It points out that there has been an increase in pickpocketing incidents in cities and cemeteries throughout the country. What prompted the updating of the guide to focus on Israeli drivers? We don't know for sure, but we suspect someone in the department may have seen the following video. Thanks so much for the sidebar link. I appreciate it! Vid is not relevant. There weren't 500 other cars on the track at the same time! Sharon M.